The Bridge opens with a shot of a bomb falling near an unnamed German town, and almost hitting a small bridge. It’s a near-miss, but the war has already touched the town, which is now nearly devoid of adult men. Only women and children are left behind to keep it running in the last days of World War II. Soon their ranks will thin as well, but for the moment, the teenage boys are making the most of it, becoming almost giddy at the thought that the war they’ve grown up hearing about is drawing so close to home—and at the thought of fighting for the German cause they’ve grown up believing is just and right. On a map, they second-guess the strategies of their country’s military. One initiates a sweet romance with a classmate. A few others find a cache of liquor hidden down by the shore. When their draft notices come, it seems like the beginning of another chapter in their ongoing boyhood adventure. It isn’t, of course, but part of what makes Bernhard Wicki’s 1959 film The Bridge so effective is the time it spends with the seven central characters—all 16-year-olds—before letting them encounter the horrors of war. The Austrian director and co-writer (adapting Gregor Dorfmeister’s 1958 autobiographical novel) first establishes the patterns of everyday life in a place struggling to retain some kind of stability. He looks at the ways fascist ideology, and fear of failing it, has been woven into everyday life. It’s obvious that the war is drawing to a close, and that Germany will be on the losing end of it, but saying this out loud remains verboten. The war has touched the boys’ lives in other ways, too: Jürgen (Frank Glaubrecht) has a portrait of his father in uniform hanging in the home he shares with his mother. His father gave his life for his country, and Jürgen hopes to have a chance to honor his legacy. Walter (Michael Hinz) resents his father, a Nazi official, first for sending his mother away, then for leaving him behind as the enemy approaches. Walter knows he’ll show more courage when his time comes. Wicki lets the camera linger on key details without commenting on them explicitly. Though The Bridge was only his second feature, and his first narrative film, he brings a tremendous sense of confidence to the project, letting the details of life on the home front heighten the tragedy to come. To others in the town, it’s obvious that their being drafted is an act of desperation. A sympathetic teacher (Wolfgang Stumpf) pleads with the soldier charged with training the boys to keep them away from the action. When their unit is called up for battle, that soldier makes the last-second decision to put the kids in charge of defending the bridge leading into their hometown, a bridge he and the sergeant he places in charge of them know need no defending at all, since it’s scheduled to be strategically demolished. But the boys don’t know this, and when their sergeant is killed by fellow German soldiers after some confusion, they dig in, determined to keep the bridge safe in spite of overwhelming odds. Wicki stages their night on the bridge as a series of mounting horrors. Assuming duty in late morning, after only a day of basic training, the boys goof around and express bravado, then dismay, as trucks bearing fellow soldiers try to pass over the bridge in retreat. One of them offers a view of badly wounded men. As night turns into morning and morning into day, the sense of danger grows. Then the tanks arrive, and the war they’ve dreamed about for so long hits home. An actor-turned-director, Wicki spent part of the war in a concentration camp due to his leftist sympathies. In an interview included on this new Criterion Collection edition of the film, he says he turned Dorfmeister’s “hymn to German courage” into an an anti-war film “by changing substantial portions, not in terms of plot, but of attitude.” Dorfmeister drew on the lives of the boys he grew up with for the novel, and told their stories in flashback. Wicki’s film opts for a straightforward chronology, a choice that plays as truer to how war works. We see how the boys live. Then we see their lives come to an end, not as the resolution to their stories, but as the result of getting swept into a story bigger than themselves, one they can’t possibly understand. Wicki is sympathetic, but also unsparing. In another supplement included on the disc, director Volker Schlöndorff talks about how the film spoke to him, and others of his generation, in a way other German movies made after the war didn’t. 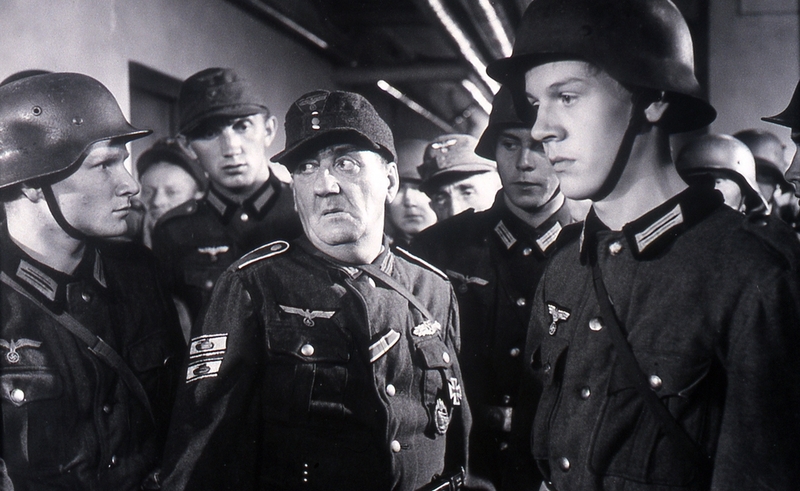 Where other films made in West Germany after the war emphasized the heroism of the “good German,” the people who remained virtuous in spite of the awfulness of Hitler, The Bridge doesn’t even let its innocents off the hook. They’re good simply because they haven’t had a chance to act on their principles yet. In another extended Criterion interview, Dorfmeister (now an octogenarian) recalls the events that inspired his novel as if they happened yesterday, how he enjoyed being in the Hitler Youth because it was “95 percent about sports,” and how seeing his dead classmates made him, in his words, “a pacifist for the rest of my life.” Those around him, like the boys in the movie his story inspired, never got such a chance. Wicki enjoyed great success with The Bridge that he never really experienced again as a director, despite working on and off behind the camera for the rest of his life. (He directed the German segment of The Longest Day and a couple of forgotten Hollywood films, but worked more steadily as an actor, appearing in the New German Cinema films of those he inspired, like Wim Wenders and Rainer Werner Fassbinder.) A 1989 interview about his career and an excerpt from a documentary about his life help provide some context, as does the Schlöndorff interview. A Terrence Rafferty essay offers an insightful analysis of Wicki’s stylistic choices. But the best feature is the Dorfmeister interview, which is raw, honest, and moving, illuminating the film by illustrating just how close it is to the experiences of the man who experienced it, and lived to immortalize it.